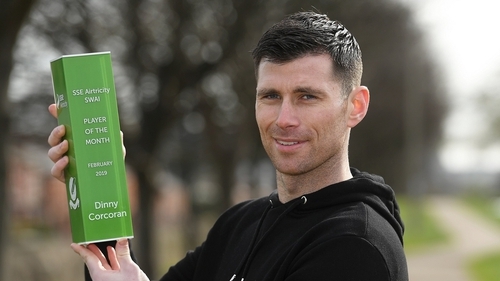 Bohemians striker Dinny Corcoran has scooped the SSE Airtricity League/Soccer Writers’ Association of Ireland Player of the Month for February. Corcoran has been in prolific form in front of goal since the start of the new season, hitting three goals in as many games for Bohs. He also scored the decisive goal in their Dublin derby against Shamrock Rovers last month, who are currently just two points ahead of Bohs at the summit of the table. "It’s great to win the award," the 30-year-old said after winning the award ahead of team-mate James Talbot, and Ciaron Harkin of Derry City. "Personal achievements are always good, but more importantly we’ve had a great start to the season as a team and hopefully we can push on and get more points on the board now. "I’m feeling good and I had the perfect start to the season personally with the three goals. We also kept three clean sheets in those games, which is nice." The Gypsies lost at lot of first-team players over the winter, but Corcoran's scoring form has been instrumental to their winning momentum so far. Manager Keith Long has also discovered some young talent which has added depth to their squad. "We lost three or four big players last season, but I think Keith must be used to it at this stage as it has been happening regularly over the last few years due to other teams having more money," adds Corcoran. "We’ve improved the squad well with a number of young lads coming home from England who are eager to prove themselves in this league. So far, so good."